Do you have an outdoors man in your life? I certainly do! Just about all the men in my church hunt, so I am constantly looking for creative outdoorsy type cards to make for them. This can be a real challenge as there is only so much you can do with a bear, deer, or elk image. But today I have a couple of card examples to show you that utilizes these images in unique ways. Both cards were made using the retired Stampin Up! set 'Pines' and sentiments from other sets. I chose rustic papers like Confetti White and Natural for my backgrounds, and earthy browns for my card bases. For the moose card, I simply created a scene by cutting out designer paper and cutting in a curve. I then stamped some grass on it. 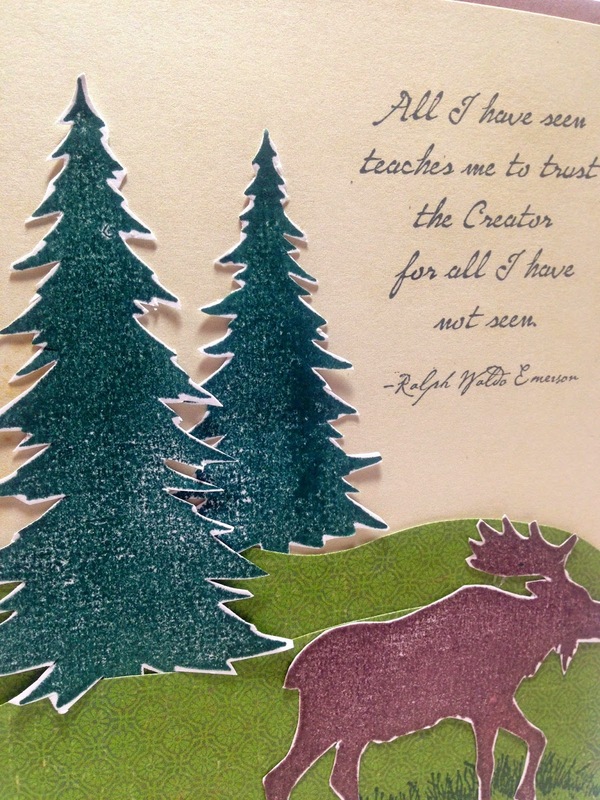 The moose and trees were on stamped on separate sheets of paper, cut out, and popped up on dimensionals. The sentiment is retired Stampin Up! "All I Have Seen". For the bear card I cut a tag out of designer paper using a Spellbinder's Nestability Die, and added an eyelet and brown grosgrain ribbon. 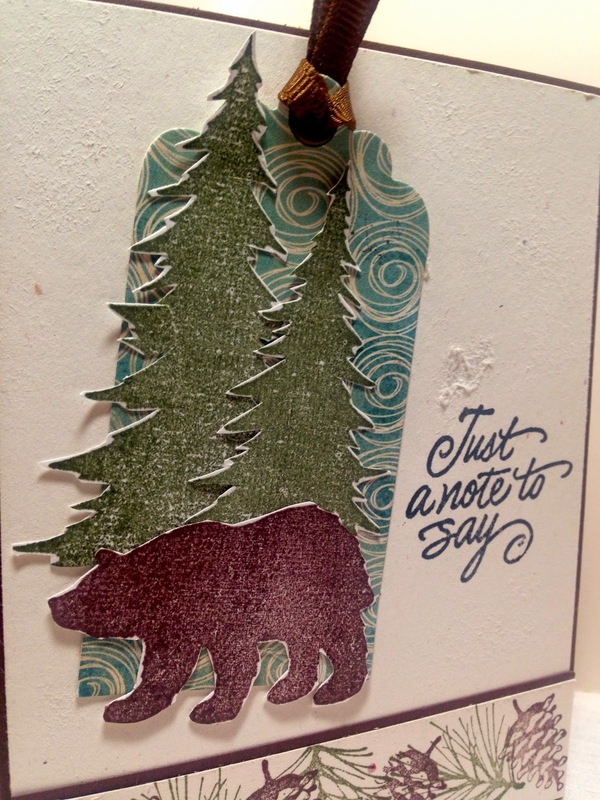 I stamped the bear and trees on a separate sheet of paper and fussy cut them out, and attached them to the tag. 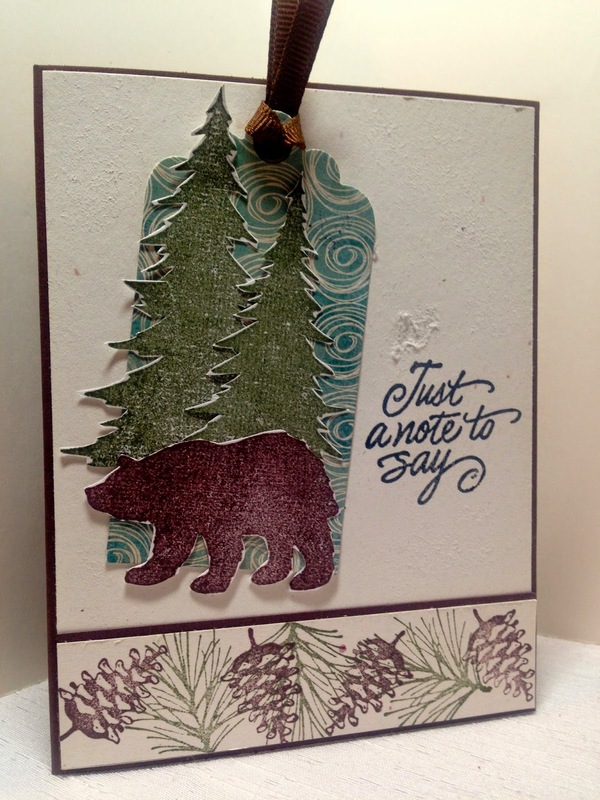 I stamped a border on the bottom of the card using pine cones and evergreen branches from the set. The sentiment is from a block stamp in my stash. Two fantastic masculine cards! Love the fussy cutting! Great designs!